Happy Memorial Day Everyone!!! 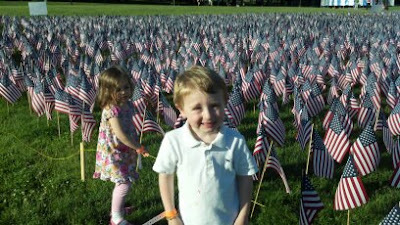 We checked out the flags on the Common and the first of many red, white and blue outfits! Angela and I went with a bunch of our neighborhood friends to this HUGE new playground just outside of our neighborhood. There were 5 moms with 9 kids among us. Most of these kids will all go to school together and we know then because the big brother/sister go to school together now. Missed so many good photo ops this day but you can see Julia and JoJo. As I have said before, the best part about having a few Red Sox tickets is getting to bring friends! This day we brought our new neighborhood friends the Cincotti's to their first ever baseball game. It was also their first time on the T. They have two cars and one of the VERY rare garages in the neighborhood and Julie loves her car! 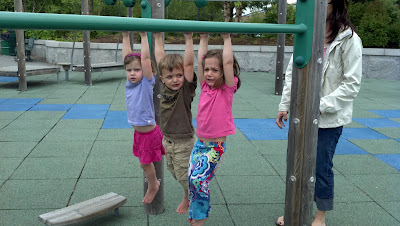 So much fun since all of these kids get along so well. Since Babci was here to celebrate Mother's Day weekend, we decided to take her to one of our favorite places....the zoo! This is one of the only memberships we have because we love it that much. We were excited to see a few new play spaces and of course hit the bird house. My kids adore the bird house.....well in principle they do. In reality they tend to freak out a bit when a bird actually hits their stick. But, we continue to visit it because it is one of those fears they HATE to have. Have to conquer it! Angela had her first day of beauty! 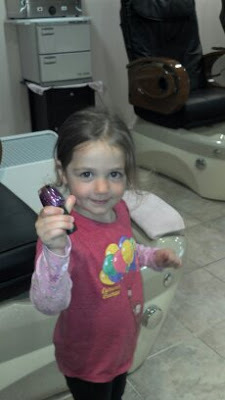 Well really I needed to get a mani/pedi for my trip to Turks and Caicos so she had to come along. She loved it! Picked out the brightest purple nail polish they had. THEN her first haircut. I can't believe I didn't get my kids hair cut until she was almost 3. Oh well. She did great although I cried my eyes out watching my baby turn into a big girl right in the salon. Bye, bye curls and hello adorable bob that is much neater and cleaner. We are all much happier with this hair cut.